This flower girl dress has a pure silk bodice with ruffled collar detail finished with an 8 layer tulle skirt. This dress is available in ivory and white pure silk and tulle. The bodice of the dress is made in pure silk and the sash can be made in a range of silk colours. Please see the silk colour swatches below and send an email to [email protected] with your address and reference numbers for the silk swatches that you would like to see and we'll post them out to you. This flower girl dress is fully lined with button fastenings at the back and a gathered waistline. As we make all of our flower girl dresses to order we can make changes to all of our styles so do contact us if you have a particular style in mind. These flower girl dresses are made-to-order and available in sizes 3 months to 12 years (if you would like a larger size please email [email protected]). A white tulle and silk flower girl dress with a big silk bow in any of 140 different silk colours. 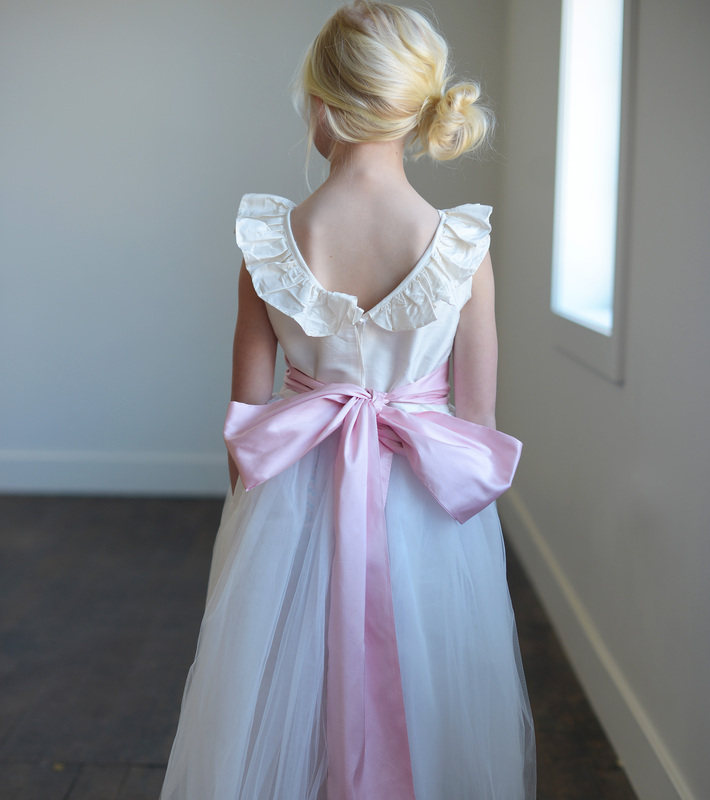 The Ruffle Ballerina flower girl dress is available in white and ivory and the sash can be in any of 140 silk colours. The Ruffle Ballerina is a handmade to measure and customisable flower girl dress with a silk bodice and a tulle skirt. The Ruffle Ballerina flower girl dress has a ruffle silk bodice and full tulle skirt.